44 • October 2014 • S I G N & D I G I T A L G R A P H I C S DIGITAL PRINTING AND FINISHING DIGITAL GRAPHICS Q: Considering current application trends, what types of new wide- format applications do you see unfolding in the future? 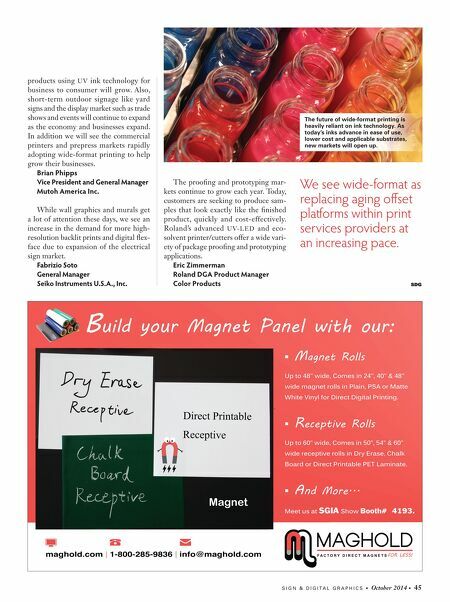 We see wide-format as replacing aging offset platforms within print ser- vices providers at an increasing pace. The opportunity for these PSP's is two-fold. First, they will be able to produce the same deliverables for their clients on a more nimble platform, which may pro- vide an opportunity to promote faster turn-around times. Second, the progres- sive PSP will be technologically enabled to truly add value to their printed prod- ucts via more short-run, localized solu- tions. Brent Moncrief VP, Sales & Marketing Durst Image Technology U.S., LLC I see home décor and specialty printing to increase through the use of UV ink and printer technology. Dye- sublimation applications are expanding to include increased use of customiza- tion for clothing and accessory items. The vehicle graphics market has added paint replacement as a new market. We see this as a great opportunity to increase digital printing by printing on the col- ored vinyl for a new and different look. This is a new and growing opportunity. Also further integration of digital print- ing into the traditional sign and screen print manufacturing. Brian Phipps Vice President and General Manager Mutoh America Inc. New marketing trends that turn flat paper into 3 D objects or appear in 4D using augmented reality could easily be applied to wall graphics, P.O.P. and more. Recently, this concept was brought to light when the IKEA catalog used aug- mented reality to give a virtual preview of furniture in a room. Fabrizio Soto General Manager Seiko Instruments U.S.A., Inc. While not exactly "new," dye subli- mation is growing rapidly, and we are seeing this process being used for a con- tinuously widening range of textile, soft signage and hard surface applications. On the eco-solvent side of things, wrap continues to grow at a steady pace, and that growth is not just from the vehicle market. There is growing demand for wrapping all kinds of objects, from walls to tool boxes to musical instruments. It's amazing to see what people are enhanc- ing with digitally printed graphics these days. 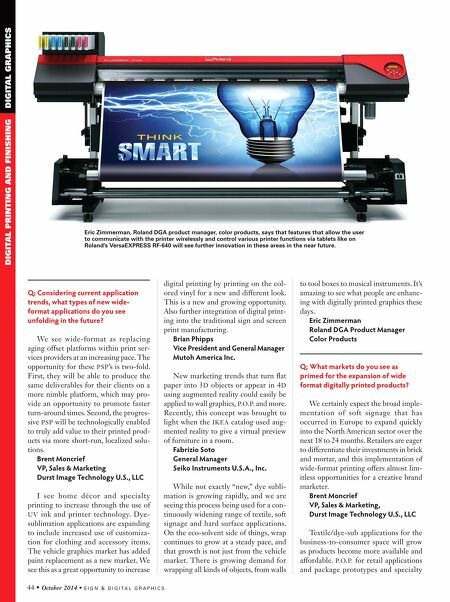 Eric Zimmerman Roland DGA Product Manager Color Products Q: What markets do you see as primed for the expansion of wide format digitally printed products? We certainly expect the broad imple- mentation of soft signage that has occurred in Europe to expand quickly into the North American sector over the next 18 to 24 months. Retailers are eager to differentiate their investments in brick and mortar, and this implementation of wide-format printing offers almost lim- itless opportunities for a creative brand marketer. Brent Moncrief VP, Sales & Marketing, Durst Image Technology U.S., LLC Textile/dye-sub applications for the business-to-consumer space will grow as products become more available and affordable. P.O.P. for retail applications and package prototypes and specialty Eric Zimmerman, Roland DGA product manager, color products, says that features that allow the user to communicate with the printer wirelessly and control various printer functions via tablets like on Roland's VersaEXPRESS RF-640 will see further innovation in these areas in the near future.